She was a political and social worker and a four times MLA from Panskura Purba, from 1967 to 1977, and seven time Member of Parliament elected from the Panskura constituency, from 1980 to 2000, in the Indian state of West Bengal. Born on 8 January 1924 in Calcutta, was secretary of Bengal Provincial Students Federation from 1947 to 1951. Was at the forefront of mass-movements in Calcutta in 1945-6 demanding liberation of INA prisoners and against the brutal suppression of the Naval Mutiny in Bombay. She played a leading role in the Post and Telegraph employees’ strike in July 1946, and was an important organizer in the peasant movement in Medinipur after Independence. Was elected a member of the State Committee of the CPI in 1946, and of the National Executive from 1981. She married Communist leader Biswanath Mukherjee. 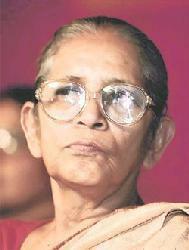 She won every Lok Sabha election from Panskura, West Bengal, from 1980 till her death in 2000. She was the principal architect of the first Women’s Reservation Bill in 1996. She also wrote for children, including Bharat Upakatha (Folktales of India), Chotoder Rabindranath (Tagore for Children) and He Atit Katha Kao; and translated Bruno Apitz's 1958 classic Naked Among Wolves to Bengali.